Young players from Ilkeston RFC followed in the footsteps of legends by playing at Welford Road on Sunday, home of 10-time English league champions Leicester Tigers. On the same day that Tigers hosted Saracens in the Premiership Rugby Cup campaign, Ilkeston Under-10s were in action in the Prima Tiger Cup. They had the opportunity to play at the iconic stadium in front of family and supporters, and also had a team photograph taken on the famous turf. The Prima Tiger Cup, sponsored by Prima Solutions of Loughborough, is enjoying its biggest-ever season with more than 70 teams entering the first-round stage played over festivals in Norfolk, Staffordshire, Leicestershire and Nottinghamshire. Ilkeston were joined by teams from Lichfield, Melton Mowbray and Tamworth in the Prima Tiger Shield, with Hinckley, Kesteven, Nuneaton and Syston also taking part in the Prima Tiger Bowl. 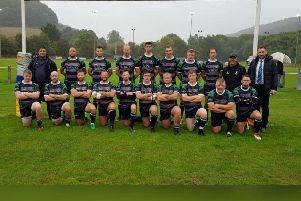 Tom Hardy, coach at Ilkeston, said: “It is our first time involved with the Prima Tiger Cup and the rugby has been really good, as has the whole event. “The kids have been absolutely bouncing all day at the chance to come and play at Welford Road and, as a team-building exercise, it has been great. It has now given us a goal to build to in other matches.